Best Home Safe: First Alert vs SentrySafe vs Honeywell vs Barska etc. Best Home Safe: First Alert vs SentrySafe vs Honeywell vs Barska vs Stack-On & More! Do you worry about home intruders or in-home workers stealing your most precious possessions? Even if you have a home security system, a home safe can provide an added layer of security against burglars, as well as protecting your valuables from repairmen, housekeepers or other visitors. Why Get A Home Safe? Getting a home safe is a wise investment. Just consider the statistics. More than 2 million burglaries are reported in the U.S. every year, with 66% of those being home invasions. Whether you want to protect your valuables against fire, flood or burglary, getting a safe is a small price for peace of mind. Whether you just want a simple money safe or more space for important documents, jewelry and other valuables, we have you covered to make a smart choice. What To Consider In A Home Safe? Before we launch into our reviews, there are several factors you should consider when shopping around for the best safe for home use. Where Will You Put Your Safe? Home burglars typically spend 8-10 minutes in a home, according to the Federal Bureau of Investigation. Where’s the first place they head? A majority head to the master bedroom. Consider these stats when deciding where to put your home safe. What Will You Be Putting in Your Safe? If you’ll be storing cash, digital media, important documents (like birth certificates and wills or photo albums), you’ll want a fireproof and water resistant safe. If you plan on storing valuable jewelry, family heirlooms or firearms, you’ll need a safe with added security features. What Size Safe Should You Get? Obviously, the size largely depends on what you plan on storing and where you have room for your home safe. If you’re investing a sizable amount of money, it’s a good idea to go a bit larger to give you room to add other items. Our best home safe reviews give you our top picks for all kinds of safes, including security features, pros and cons, pricing and much more. We’ve based our recommendations on several factors, including security features, quality, durability, value, ease of use and installation, warranty and more. We do include one gun safe in our reviews but check out our full gun safe reviews for more. The First Alert 2092DF is our top choice for the best home safe. This model is a triple threat, offering excellent defense against fire, water and theft. Not only is the First Alert 2092DF arguably the best fireproof safe for your home, but it’s also one of few home safes on the market that can float and stay dry even when fully submerged. This safe’s anti-theft features are equally impressive, including four solid locking bolts, pry-resistant concealed hinges, and excellent anchor technology that lets you bolt the safe to the floor without losing its fire and water protection. Our number two pick, the SentrySafe SFW123DSB, is another excellent choice for fire, water and theft protection. This SentrySafe model and our top pick share a lot of the same great features. What are main the differences? First, you’re not guaranteed fire and water protection if you bolt this safe to the floor. First Alert’s safe does. And the SentrySafe SFW123DSB has a combination lock rather than a digital lock, so it takes more time to open (not ideal if you want to store a handgun for home protection). But SentrySafe has four thick one-inch bolts for added security. And the humidity factor doesn’t seem to be as bad with SentrySafe as it is with our top pick. If you live in a high humidity climate, SentrySafe could be your better choice. The Honeywell 5207 Digital-Dial Steel Security Safe comes in third place as our best home safe. Unlike our top two picks, this safe isn’t fireproof or water resistant, but its security features and reputation make it a strong contender. This safe consists of thick steel plates, two solid steel locking bolts and hidden pry-resistant hinges for added security. One of the big pluses of this safe is that it has no interior humidity issues (granted, this problem stems from waterproofing technology with other safes). But if you want to store medications or other items that are extremely humidity sensitive in your safe, the Honeywell 5207 is a safe bet. Large safe with plenty of room for documents, valuables, etc. Want a quick side-by-side view of our best home safe winners? Check out our table below that compares the many features you’ll want to consider. The following safes didn’t make out top three winners, but there’s stiff competition in the home safe market. Each of these safes deserves serious consideration, depending on your security needs. The Barska Biometric Safe is an affordable and sturdy home safe. This safe is firearm certified and has fingerprint technology, making it quick and easy to open. It’s compact enough to fit under a bed but still has enough room for small electronics, a firearm, jewelry, important documents, medications and more. And it comes with bolting hardware so you can mount it to the floor or shelving. The Barska Biometric Safe is one of the best small home safes on the market. Are you looking for a hidden wall safe? Protex Electronic Wall Safe (PWS-1814E) is one of the best wall safes you’ll find. 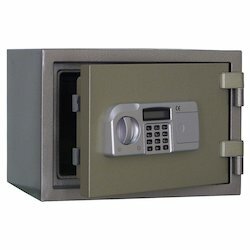 This safe consists of heavy gauge steel and has dual live motorized 3/4″ chrome bolts and a 5/8″ thick formed steel door. The digital lock is easy to open and has a 15-minute security timeout after three attempts to unlock the safe. As with most wall safes, the Protex requires either a hired contractor or strong handyman skills for installation. It fits between 16″ o/c wall studs and will accommodate any height. The Stack-On PDS-1500 Drawer Safe is a popular choice for people wanting a portable or small home safe. This compact, lightweight safe fits in a nightstand, desk drawer or under a car seat; yet, it’s also mountable to floors, walls or shelves in your home. And it features great security measures, including solid steel walls, a plate steel door, hidden pry-resistant hinges, and steel live-action locking bolts. The electronic lock is very reliable and has a timeout feature after three failed attempts. The Steelwater AMSWEL-360 is a great choice if you’re looking for a heavy duty, drill-proof and fireproof safe. With two layers of heavy gauge steel surrounding your valuables, this safe is an excellent deterrent to even experienced burglars. Steelwater also makes fantastic fire-rated safes, and this model is no exception. Another plus is the reliable electronic keypad that includes four reprogrammable (4-16) digit combinations that won’t get lost if the batteries die. Just replace the batteries in the external battery compartment, and you’re good to go. Many safes don’t have this level of combination memory. If you want major water resistance, this isn’t the safe for you. But without the waterproof sealing, you won’t face the associated humidity problems. You can’t put a price on safety, but sometimes your budget doesn’t agree. Fortunately, there’s the Zeny Digital Security Safe, a budget-friendly, Amazon-bestselling safe that’s sturdy and reliable. Constructed with 2mm thick solid steel and a 4mm thick front door for added security, this safe also has a heavy-duty chrome steel dual 3/4″ pin bolt and tamper-proof hinges. This safe also has a time-out period after three incorrect combination attempts. It’s a small safe — you can fit a small firearm or money and jewelry but not much else. Still, Zeny is one of the best cheap safes on the market. How Are Fireproof Safes Tested? Check out the video below to see how Underwriters Laboratories (UL) tests home safes like our top two winners. UL is an independent safety consulting and certification company that’s widely considered the gold-standard. We hope our home safes reviews have given you the information you need to crack into this enormous market. Especially given that crime happens more often than you think. For additional safety tips around your home to protect you and your belongings, you might consider getting a DIY home security system including an outdoor camera. Smart locks add another layer of security along with these tips on how to deter burglars. What positive or negative experiences have you had with a home safe? Sadly nothing is safe anymore…my mom’s jewelry was stolen recently and don’t want this to happen to me, so going to get one of these for sure!